The following websites can help you learn many technology skills such as creating a Facebook page, booking an airline ticket online, using Microsoft office programs, shopping online, emailing, and much more. If you are new to computers, haven't used them for a while, are a little unsure and uncomfortable, or just need a bit of a refresher, the self-directed tutorials and tips will help you tackle technology at your own pace and gain the confidence you need to succeed. 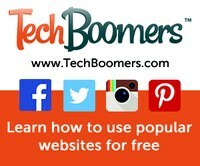 TechBoomers.com is a free educational website, featuring tutorials that teach inexperienced technology users how to use the most popular and trusted websites and Internet apps. There are over 60 free courses packed with video and article tutorials tailored for those with limited computer skills: written in easily-understood, non-technical language; providing context through real-world parallels. Video courses for learning popular software and computer basics. Also includes modules for career help, homework help, test prep materials, college tools, and high school equivalency resources. You will need to create an account to access the courses. It’s free!